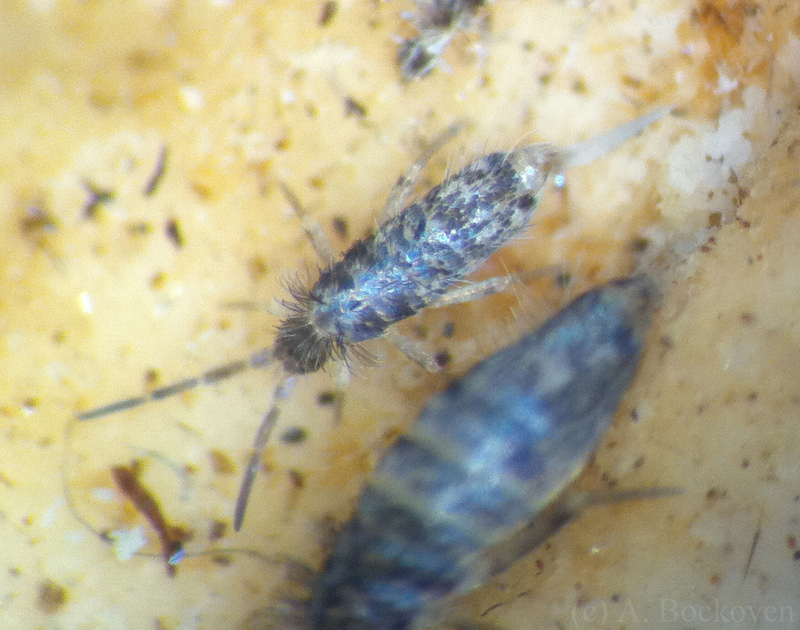 Close up of a pretty blue springtail in the detritus of a dead fire ant colony. A few of my smaller, failing fire ant colonies are infested with tiny crawling things. In the spirit of curiosity (and getting these things out of my lab colonies) I finally put them under a scope to try to figure out what they were. Turns out they’re actually rather pretty close up. They’re also a member of what may be the most abundant arthropod in the world. 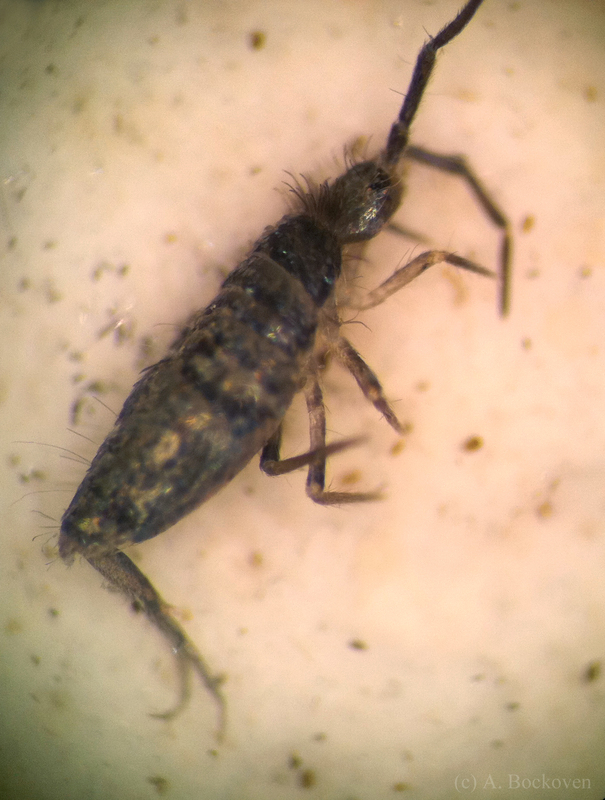 Springtails (class Collembola) are tiny, easily overlooked, and almost everywhere. Primarily detrivores and microbe-eaters, they mostly inhabit leaf litter, with an average square meter of topsoil containing upwards of 40,000 individuals (Hopkin 1997). 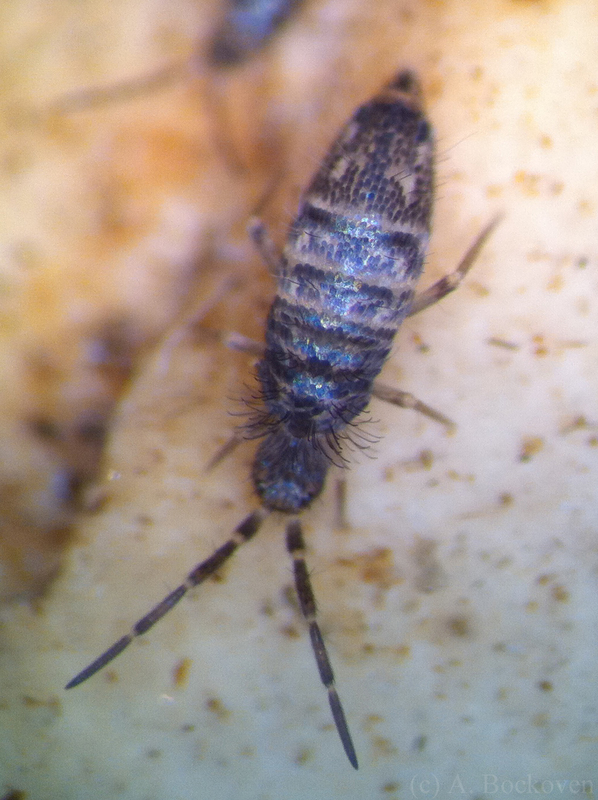 Slender springtail on its side with furcula visible. Collembolans are one of three groups of hexapods (six-legged arthropods) that are not considered part of class Insecta. 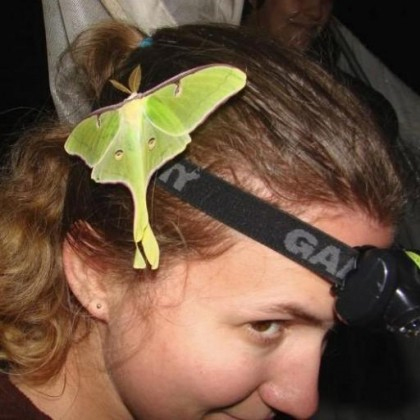 Unlike the later derived insects, they are wingless and entognathous (have mouthparts retracted into the head). Collembolans take their common name “springtails” from a unique bit of morphology that allows them to jump 20 to 100 times their height in a fraction of a second. This structure, a long forked prong called a furcula, tucks under their body into a clasp and releases like a spring, launching them into the air. In person it looks sort of as if they are vanishing and appearing elsewhere in the tray, like tiny buggy teleporters. It is easy to understand why these organisms are sometimes claimed as the source of delusory parasitosis–a condition which cause people to falsely believe they are infested with parasites. Slender springtail adult and nymph (Seira bipunctata). Look how adorable they are! These particular springtails have the characteristic appearance of the family Entomobryidae, the slender springtails. I was curious to know more about the infestation of crawlies eating the dead crickets and ant detritus in my lab so I also threw a picture onto BugGuide, where I was rewarded with a species ID a day later. They are Seira bipunctata (det. thanks to Frans Janssens). 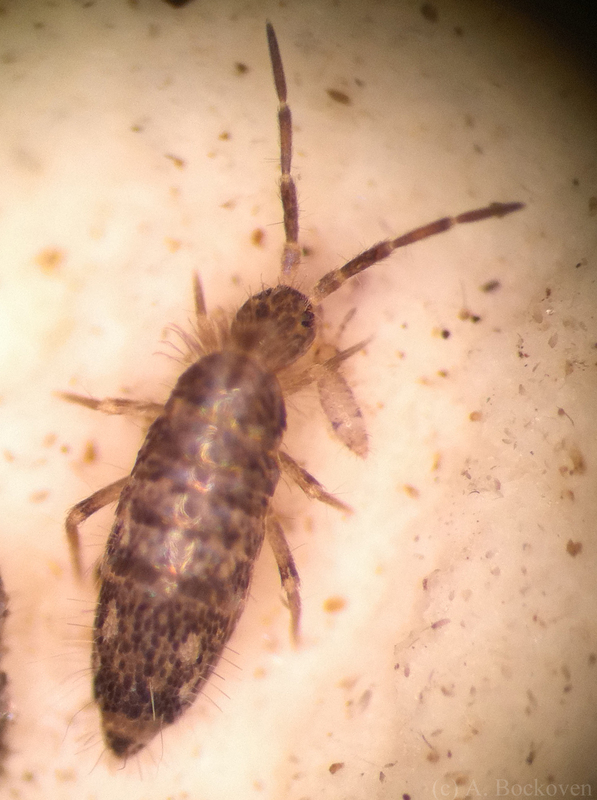 Springtail nymph with furcula extended. Unfortunately, little non-taxonomic information appears to be available on these guys, although the genus Seira is distributed throughout North America, as well as most of the world. My personal observations are that they appear to be detrivores, fairly active, and the mid-sized ones seem to leave their furculas extended and also wiggle them at me when poked. I don’t know; poking things to see what they do is pretty much my go-to technique as a scientist. Slender springtail (Entomobryidae: Seira bipunctata). One final note: One of the scientific papers I read while researching this post used the phrase “the collembological community” to describe springtail researchers. “Collembological” is now my new favorite word. I really enjoyed this post. I’ve found some interesting things living in ant colonies, including Pseudosinella springtails. 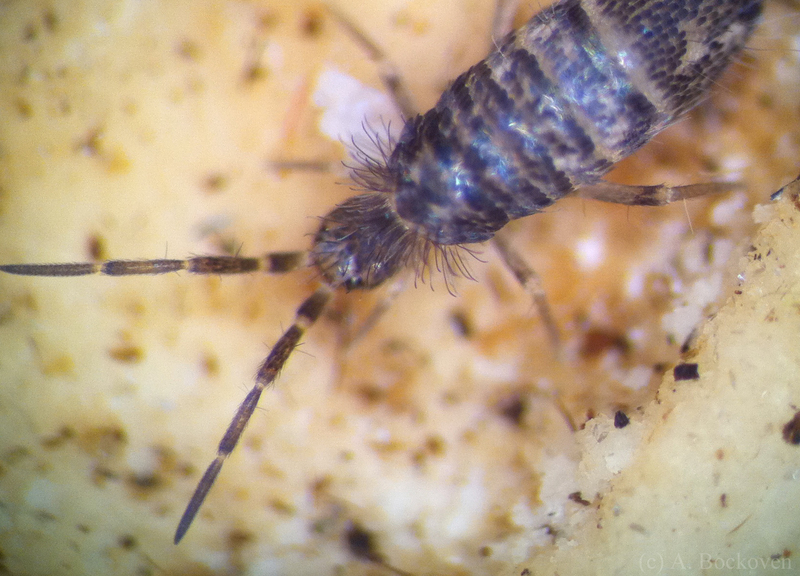 I’ve also found a few Nicoletiidae silverfish living alongside ants in rotting logs in Oklahoma. I read your post on Nicoletiids and was wondering if you might know of anyone doing research on these silverfish? Thanks! I don’t know anyone in particular, which is a shame because I think it’s a really interesting system. For the fire ant inquilines in specific I could only find a handful of references in the literature. For ants in general there’s a few more papers on myrmecophilous silverfish; mostly descriptions. Volker Witte does some work on various ant nest parasites.